Dental Veneers - #1 OC Dentist - Schedule Your FREE Consultation! Getting dental veneers is a personal, exciting experience! You want to make sure you fully understand the process, and more importantly, trust the doctor who will be placing your veneers. When looking for a cosmetic dentist, check dentist review websites to ensure the doctor is reputable and has experience placing veneers. Ask others for recommendations online or in cosmetic dentistry forums in your area. Look at dental veneers “Before and Afters” on review sites and on the doctor’s website. Scheduling the consultation may seem like an administrative step, but there are many early signs that can predict what your experience with the office will be like. When you find a dentist you want to schedule a consultation with, take note of the ease and convenience of the booking process. Was the office easy to get a hold of? Did they answer the phone promptly or respond quickly to email and text? Were they able to schedule you within the next 2-3 days or at the time your requested? You’ll want to feel comfortable in knowing you can always reach the office in case of an emergency. When you call/text/email/live chat Advanced Dental Care, one of our friendly and knowledgeable staff members will respond promptly 24 hours a day, 7 days a week (except if you live chat us at 3:00am, we may be asleep.) We provide cosmetic consultations at no charge and have evening, morning, and Saturday appointments for your convenience. We always prepare for all of our appointments by verifying dental insurance benefits prior to the appointment, and ensure that we are ready to accommodate any requests you might have. Our patients’ satisfaction is our number one priority and we mean that! It’s your consultation day! When you arrive to the doctor’s office, there are some tell-tale signs of a good staff. Did the front desk welcome you to the office? Is the office is clean? up-to-date? These little details may seem small, but staff who take pride in their workplace will most likely take care of you. In addition, having digital technologies such as electronic records, digital x-rays, and other modern equipment is another sign that the doctor stays up-to-date on the latest and greatest advancements for you. When meeting the doctor, you’ll want to make sure you feel comfortable and on are the same page. You should also discuss what type of smile you want to achieve. If you have photos of smiles you like or can point out certain things you don’t like, it is important to discuss these things early on. The goal for most dental veneer patients is to achieve the most natural look as possible. However, if your goal was to have a totally different looking smile, even if the final result did not look natural, that is something the doctor should know. What are the pros and cons of doing dental veneers? How much of my natural tooth will you have to remove? Will I experience any pain or sensitivity? What is the appropriate shade for my smile? 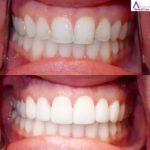 Do you have before and afters from other veneer cases? What is the entire process from being to end? And how long will it take? How long will I have to wear temporary veneers? What is the upkeep for the permanent veneers? What happens if one cracks or falls off? How much do veneers cost and do you offer payment options? The last step to getting your gorgeous new smile is to schedule your appointment. Any permanent cosmetic procedure is something to research and perform your due diligence, but once you have your dental veneers you’ll wonder why you waited so long to get them! Call (714) 424-9099 or book online anytime at www.mycostamesadentist.com. We are conveniently located in the South Coast Metro area near the 405, 55, and 73 freeways. Please call, email, text, or live chat us with any questions!